Get out of town with these interesting Perth side-trips: Caversham Wildlife Park (in Whiteman), The Vines Mini Golf (in The Vines) and Fremantle (Fremantle Prison, Western Australian Maritime Museum, & more). Dedicate the 26th (Fri) to wine at some of the top wineries in the area. 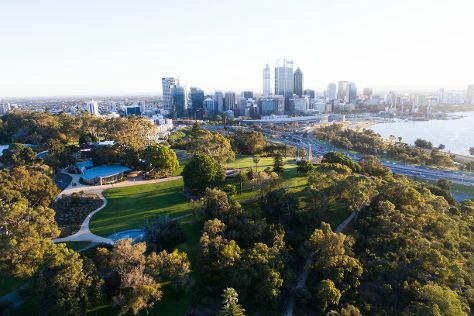 Next up on the itinerary: stroll around Kings Park & Botanic Garden, get to know the resident critters at Perth Zoo, steep yourself in history at The Perth Mint, and take in the waterfront activity at Hillarys Boat Harbour. To see other places to visit, ratings, traveler tips, and more tourist information, go to the Perth road trip app . If you are flying in from Hong Kong, the closest major airport is Perth International Airport. In April, daily temperatures in Perth can reach 31°C, while at night they dip to 15°C. Wrap up your sightseeing on the 28th (Sun) to allow time to travel back home.